• Changes in Core. Improved compatibility of non-intraday charts with TickReplay mode. • Added 'Instance Color' option to allow to dissect by color the toolbar buttons of different OfB instances on the same chart. • Added 'Diagonal Coloring — At Dominant Side Only' option to Sided Ladder Look. • Changed appearance logic of the Delta Profile Look: imbalanced rows (high row delta) are pointed by middle dot while diagonally imbalanced numbers (high diagonal delta) are pointed by numbers color. Thus the 'Diagonal Imbalance Thr.' and 'Diagonal Coloring — At Dominant Side Only' options are added to the Delta Profile Look either. 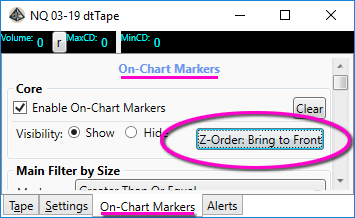 • Added 'Additionally Show Secondary Metric' option to the Delta Markers properties which allows to enable plotting of additional Markers with Delta values of secondary metric (i.e. to show additionally Tick Delta if Base Metric = "Volume" or Volume Delta if Base Metric = "Ticks"). Delta values of Base Metric will be shown with Bold font. • Added 'Label Outline' checkbox to control Delta markers outline (on/off). 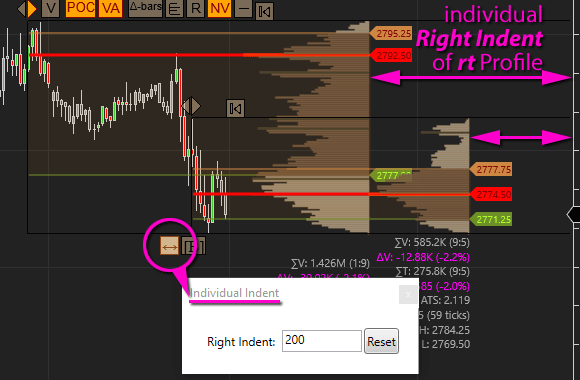 • Added individual Right Indent property to Custom Range Profiles in real-time mode. • Reorganized and added new Period Mode options of Composite Profile (see 'Period Start Mode', 'Period End Mode', 'Start Date & Time' and 'End Date & Time' properties of Composite). 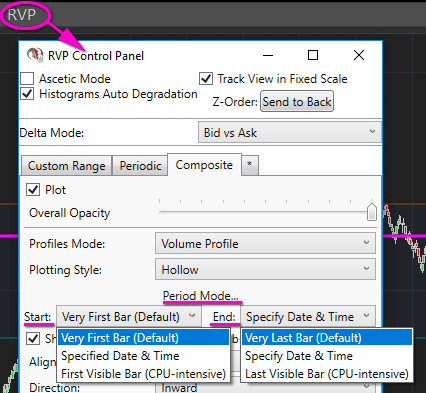 • Reorganized and added new Period Mode options of Composite Profile (see 'Period Start Mode', 'Period End Mode', 'Start Date', 'Start Time', 'End Date' and 'End Time' properties of Composite Profile). • Added new "NBarsStep" Periodicity option for Periodic Profile (see '2. Periodic Profiles (PPs)' settings section -> expand 'Periodic Profiles' group -> 'Periodicity' and 'N-Bars Step' parameters). Note: Custom N-Bars Step is aligned to Session beginning, thus the "NBarsStep" Periodicity is eligible for intraday charts only. • Added capability to choose Marks Shape (Double Arrow, Triangle, Diamond, Circle) for both Sided and Delta Ladder Filter Marks. 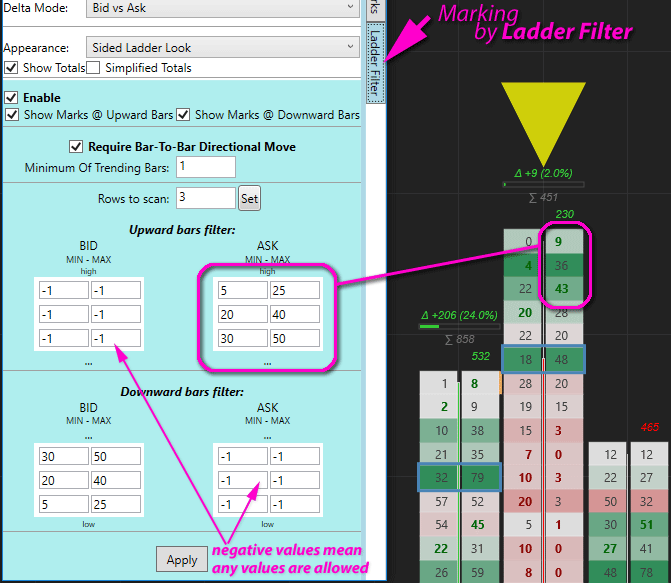 • Added marks based on filter by Delta Ladder; see 'Δ Ladder Filter' options in the OfB Control Panel. • Visual representation of markers was changed to distinguish between marks of Sided Ladder Filter and Delta Ladder Filter: marks of the Delta Ladder Filter are drawn as simple triangles (which looks like Delta symbol); while marks of Sided Ladder Filter are drawn as Two Arrows sign (which symbolizes bid/ask sides). • Added mark size related settings ('Auto Size' option, 'Custom Size' and 'Vertical Offset' parameters) for Ladder Filter Marks in the OfB Control Panel. • Added a special hint to the 'Diagonal Imbalance Threshold' and 'Row Imbalance Threshold' sliders in the OfB Control Panel which allows to see the approximate Ratio value (i.e. dominant side vs weak side ratio, which may be more easy to understand) that corresponds to the currently set slider position (i.e. 1x..2x..10x..etc instead of 0...100). • Added options of Summary Info block to choose which information to print. See '1. Appearance Settings' section -> expand '1. Frame Settings' group -> 'Summary Info - Print Volume', '- Print Ticks', '- Print ATS' and '- Print Price Range' options. • Added info on High and Low price levels of profile's period in the Summary Info block. • Added secondary Ladder Filter with related controls in the OfB Control Panel; see 'Filter 2' sub-tab in the 'Ladder Filter' mode of settings editor. • Added color pickers for the Ladder Filter Marks settings in the OfB Control Panel. • Added 'Ladder Filter' Marks which allow to mark bars filtered by specified Bid/Ask values (fills at Bid/Ask or UpTick/DownTick). It is possible to use separate Ladder Filters for Upward and Downward bars. Upward bars are scanned starting from High of the bar. Downward bars are scanned starting from Low of the bar. Filter criteria are controlled from the OfB Control Panel, see 'Ladder Filter' tab. • Added 'Show Totals' and 'Simplified Totals' checkboxes in the OfB Control Panel to easily control the visibility and appearance mode of the Totals info. • Added 'Delta Ladder Look' appearance mode. • 'Ladder Look' appearance mode renamed to 'Sided Ladder Look'. • Added 'Max Num Of Periodic Profiles' parameter (see '2. Periodic Profiles (PPs)' settings section) to limit the number of periodic profiles to create on start up. The parameter is set to 0 by default which means no limit. 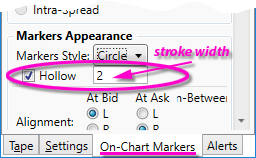 • Added 'Hollow' appearance option for Circle and Square on-chart markers. 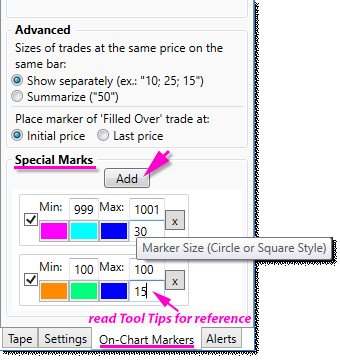 • Added 'Special Marks' editor in the 'On-Chart Markers' tab where you can add/remove specific criteria (filter by Trade Size) in order to gather and plot markers of specific trades with different color and marker size. • 'Fixed Bar Width' checkbox with related 'Bar Width' parameter. • Added capability to change relative Direction of profiles in addition to existing options of Horizontal Alignment (see 'Direction' parameter in the settings of Custom, Periodic and Composite Profiles as well as corresponding controls in the RVP Control Panel). • Added capability to adjust horizontal location of histograms of Periodic Profiles (see 'PPs Histogram Shift' slider in the '*' (Extra Settings) tab of the RVP Control Panel). Time & Sales window with the original size reconstitution of underlying initial market orders and many other features. Fast and flickering-free. Versatile unique tool that works as Volume Profile, Floating Volume Footprint and Volume Painter, and thus as Clusters Detector. The indicator uses a defined plain text file with the specified price levels data in a plain text file. Catches big orders in the Order Book (aka Depth Of Marker or Level II) and puts them on the price chart. Now you have never miss out any flickering big size on the DOM. The tool of a contextual analysis of any specified metric like the volume, the bar ranges, some index, etc. It makes possible to compare the metric in relation to its average over the sessions (days). Plots price levels of where average daily or session range will be achieved in the current session. Bundled with dtFixedMovements indicator. Pleiad of different kind of "averages" and bands which can be combined with each other in a variety of combinations. Cumulative averages, averages of fixed period, VWAP, developing POC & VPOC, developing bar- and volume-based Value Area, linear regression, percent envelopes, Keltner channels, Bollinger bands, etc. 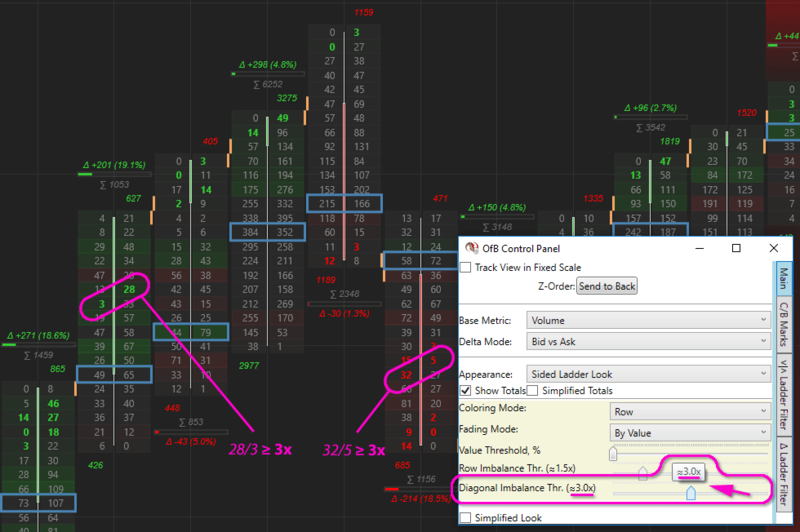 Most flexible Volume Profiling tool for NinjaTrader. Plots custom and/or composite Volume Profiles, Tick Profiles and Average Trade Size histograms for user-defined period. 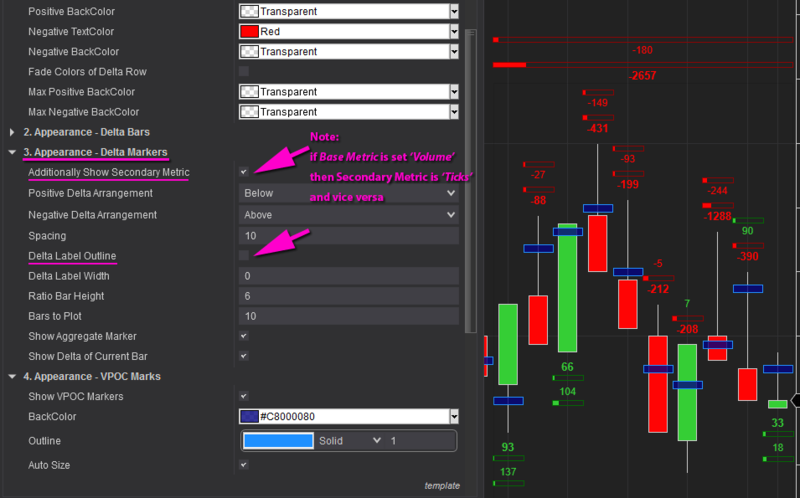 Simple Tick Reversal bars type which is based on a similar concept as the Point and Figure charts but much easier in customization — it has only one parameter. Simple volume- or tick-based delta per bar. Plots price levels of where average daily or session range will be achieved in the current session. Time & Sales window for NT8 with the original size reconstitution of underlying initial market orders and many other features. Fast and flickering-free. Simple Tick Reversal bars type for NT8 which is based on a similar concept as the Point and Figure charts but much easier in customization — it has only one parameter. Simple volume- or tick-based delta per bar. Cumulative delta. Bracket cumulative delta. Most flexible Volume Profiling tool for NinjaTrader 8. Plots custom and/or composite Volume Profiles, Tick Profiles and Average Trade Size histograms for user-defined period. Versatile unique tool that works as Volume Profile, Floating Volume Footprint and Volume Painter, and thus as Clusters Detector. Aimed at experienced traders.